In a series of playful and startling prose meditations, celebrated writer Lorna Crozier brings her rapt attention to the small matter of household objects: everything from doorknobs, washing machines, rakes, and zippers to the kitchen sink. Operating as a sort of literary detective, she examines the mystery of the everyday, seeking the essence of each object. She offers tantalizing glimpses of the household's inhabitants, too, probing hearts, brains, noses, and navels. Longing, exuberance, and grief color her reflections, which at times take on the tenor of folktales or parables. 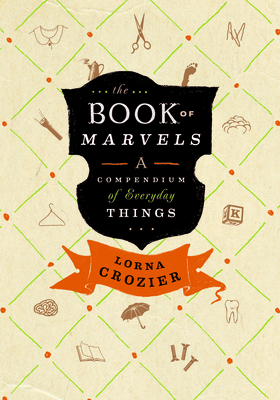 Each of the short portraits in The Book of Marvels stands alone, but the connections are intricate; as in life, each object gains meaning from its juxtaposition with others. Crozier approaches her investigations with a childlike curiosity, an adult bemusement, and an unfailing sense of metaphor and mischief. With both charm and mordant wit, she animates the panoply of wonders to be found everywhere around us and inside us. Lorna Crozier, one of Canada's most celebrated poets, has read from her work on every continent. She has received numerous awards, including the Governor General's Award, for her fifteen books of poetry, which include The Blue Hour of the Day, What the Living Won't Let Go, Everything Arrives at the Light and Inventing the Hawk, and her memoir, Small beneath the Sky. She has also edited several anthologies, among them Desire in Seven Voices and, with Patrick Lane, Addicted: Notes from the Belly of the Beast. She lives in Saanich, British Columbia.